La Negra 😛 Until now, the only mentions I had made on this blog about my birthday were in the letters I started writing to Thalia in 2010, every year one day before my b-day (you can find them here). Thalia’s 9th studio album, El Sexto Sentido, was released on July 19, 2005, with 12 tracks and 3 English versions. It had a great debut in Billboard’s Top Latin Albums (#3) and got two Gold certifications in Argentina and Mexico and two Platinum ones in the USA, being sold in nearly 300.000 copies. Now, enough with the numbers, why don’t we go a little bit behind the story of this album? 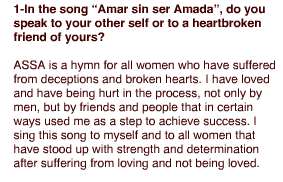 On the special website released for El Sexto Sentido (http://thalia.com/elsextosentido/) we can find a section titled “T Undressed“, where Thalia herself answered to some questions about the album. I think it’s pretty interesting, so I’m going to choose a few of them and show them here as well. 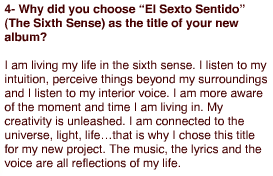 As for the songs, El Sexto Sentido is definitely one of my favorite albums and I think that was pretty obvious, since a lot of my “Song of the week” posts were inspired by this album and my experiences and how I felt during those weeks. In case you missed them, here’s Olvidame, No me voy a quebrar, 24.000 besos and Cantando por un sueño, from the Re+Loaded album. It’s worth mentioning that Un alma sentenciada is also one of my favorite ballads, as well as Loca, while Amar sin ser amada and No puedo vivir sin ti are as well on my list of favorites from this album. PS: 1. Look at her body on the ASSA Grammy performance! The time has come for me to finally write about this GREAT album and as I was sitting here listening to it and trying to let words come out, I somehow feared I couldn’t deliver a post as good as this album is… I thought to myself “How am I going to do this? This is one of the greatest and most important albums of Thalia’s career, it deserves something special.” And then it hit me. 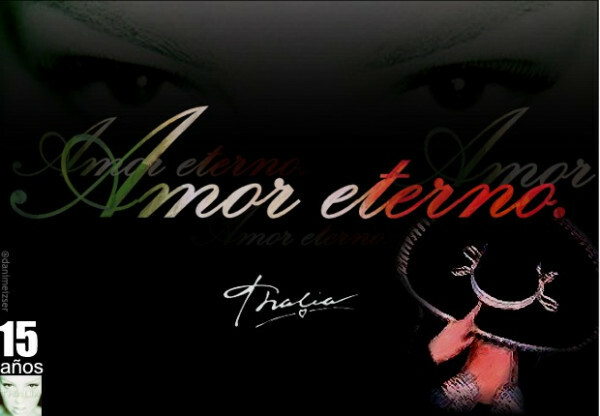 Since this album was basically the one to bring Thalia’s worldwide fame, since so many people from countries all over the world have been listening to it for the past 15 years, enjoying every song, letting themselves be taken by the music into a Mexican journey, the best way of paying a tribute to this album is by finding out what those people think about it, what they feel when they listen to each of the 10 songs of this album which has become a classic of the Latin music. Since “Amor a la Mexicana” conquered America, Europe and even Asia and Africa, this post is going to be a multilingual one, as I’m honored to count with the participation of fans from Philippines (@NuestraThalia), Kuwait (@MiFuerza_Thaly), Côte d’Ivoire (@christelthalia), Greece (@Spike_23), Brazil (@FlaviaTropia), Cuba (@LaNegraNathalie), Argentina (@danimeizser) and of course, Mexico (@mary15902). THANK you all so so much for being part of this. With no further introduction, take a cup of coffee or a cold drink, sit back and enjoy! PS: It’s going to be a LONG post, structured in MANY pages, to read them just navigate through them at the bottom of this post. Thalia’s 10th studio album, Lunada, was recorded in 2008 and released worldwide the same year, on June 24. The album was produced entirely by Emilio Estefan and was the last one to be released through Emi Music. Only 2 singles were extracted from the album, the first one, Ten Paciencia, which eventually was the only one from the disc to have a video clip, and the second one, Sera porque te amo, a Spanish cover version of the Italian song “Sara perche ti amo” by Ricchi e Poveri. Despite the lack of promotion from the record company, the album was #10 in Billboard’s Latin Albums and #4 in Latin Pop Albums. It’s a total beach album for the summer, for partying, that includes songs that were a part of my summer catalog growing up, like Juan Gabriel’s “Insensible.” On the other hand, there are strong and uplifting songs as well, like “Ten paciencia,” or the song that I wrote for my daughter, “Bendita”. One of my biggest goals in life is not necessarily to sing or act, or be a great business woman–although that’s important–but to entertain and fill people with positive energy, and inject happiness into their lives. That’s what I wanted to do with Lunada. Considering these words, in my opinion Thalia did a really great job with this album and totally fulfilled her goal to fill people with positive energy and happiness with it, I for one definitely feel like she has. Ever since I first listened to this album, without even knowing anything about its history, I instantly felt that it was meant to be a summer album, with rhythms that remind you of the beach, the sun and the sea, which make you wanna dance as soon as you hear them and give you a really good mood. If I were to talk a little about the tracklist, I’d say that Sangre Caliente is the hottest song I’ve heard from Thalia, the music, the lyrics, the whole song is just… HOT. Last year I was listening to it on the beach and I thought to myself “Well, I have everything here except a guy like that” hahaha 😛 Moving on hehe, I always find myself “singing” Sera porque te amo and Isla para dos, the latter reminding me of The Little Mermaid. I actually saw a nice fan made video joining the song and images from the movie, but I can’t find it anymore 😦 Aventurero is also one of my favorites from this album, it has a great beat and I’m always amused by how people think it’s a featuring with Sean Paul (would have been great though). We also have a ballad on this album, Desolvidandote, the only song that’s out of the summer patter. Last but not least, Solo se vive una vez, which inspired my new Internet joke (see my previous post for more LOL): Thalia – singing Solo se vive una vez before YOLO was cool. The “cherry on top of the cake” of this album is Bendita, the song Thalia dedicated to her first child, her daughter Sabrina Sakaë. This is the sweetest song of this album, with lyrics full of love and baby Saki’s voice in the background. I honestly don’t care about the statistics of this album, in the end for those of us who enjoy listening to it all that doesn’t even matter. 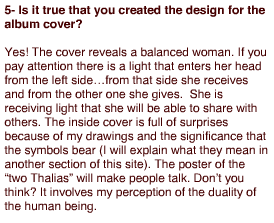 Apparently Thalia also declared that she was proud of the production and the materials included on this album and to me she has every reason to be. Skipping the hellos and kisses sent to and from different countries, let’s go to the info about her new album… I CAN’T WAIT to listen to it !!! Seriously, just look at the passion in her voice and the look in her eyes when she’s talking about it. I have no doubt it is going to be ESPECTACULAR just like she’s said it would be. What really “swept me off my feet” and made me already fall in love with her new album without even having listened to it yet was the image of her whispering that one word that she thinks best describes it: espectacular. Moving on from the album, the next subject I’d like to mention is food. If I were to make some Internet jokes I’d say that Thalia doesn’t always do a Twitcam, but when she does, she has to talk about food. or One does not simply have a conversation with Thalia without food being involved. They may be really uninspired, but you got the point 😀 Here’s something not many people know… when Thalia followed me the first DM I sent her was a presentation of the Romanian cuisine, hoping that it would convince her to come visit my country 😀 I’m not going to tell you what her response was, but the fact that there was a response says it all hehehe. Last but not least, I loved hearing her pronounce my country’s name… twice! Hopefully, HOPEFULLY just like she said in English (by the way, I thought it was great that she did a short translation and summary of the things she’d said during the Twitcam), with this new album she’ll finally go on a tour and maybe come here too. Well, now that I’ve exposed all my likes and “loveds”, I should also be honest and say that there were a couple of things I didn’t like about this Twitcam. The first one, the time. I was really surprised and a bit disappointed that first she was about to have the Twitcam the moment she reached 4 million followers, which happened at about 4-5 am in Romania and of course, at very similar hours in the rest of the European countries. Luckily, faith was on our side and her attempt failed, so we didn’t miss anything hehe. Anyway, in the end I really appreciated that her second attempt was at a perfect time for (almost) everyone and that during this Twitcam she didn’t forget about us and even had a few words for everyone here. The second thing I didn’t like about it was the fact that there was no snippet of one of her new songs whatsoever. During the 3rd Twitcam, our “deal” was that she’d have that prepared for us during the 4 million one, and although a twist was added in the meantime, which unfortunately didn’t end as we had expected, I still would have wanted to listen to something like that. Well, knowing her I’d say that she’ll surprise us any time now with parts of her new songs 🙂 Cause “good things come to those who wait”. Hope you enjoyed this post, thanks for reading! It’s been over a month since my last post (well, except the one for baby Matthew Alejandro’s birthday, which obviously I couldn’t not have posted :D), after this “break” that was caused by exams and other things that happened, things which affected my inspiration and mood for writing, I’m now back in business! 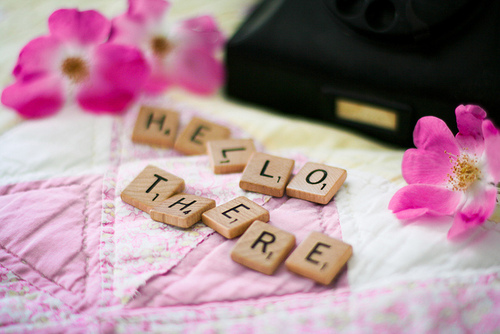 I already have a few posts in mind that have been patiently waiting to be written, so stayed tuned!